Ideal for couples, honeymooners, families, or solo travellers looking for a luxurious hotel in Dubai, Ramada Jumeirah Hotel is a 4-star property located close to many important landmarks in Dubai. It offers comfortable and modern rooms and suites, fancy restaurants, vibrant bars, rooftop swimming pool, fitness centre, lavish beauty salon and lots of other top-quality facilities and services. 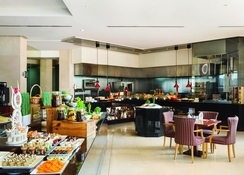 Amenities at the Ramada Jumeirah go from a conventional Scottish bar to a pool bar. Guests can also enjoy the calm Atrium café and enjoy meals at a Mediterranean and an Asian restaurant. Al Ghazal Mall is a 3 minutes' leave from the hotel. The property is minutes from Dubai's new amazing Dubai Etihad Museum. 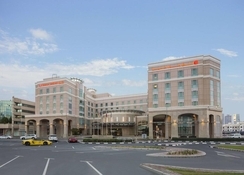 Ramada Jumeirah is a four-star hotel located in Al Mina Road, Dubai. This Hotel is 7 to 8 Kilometers from Kite Beach. It offers 252 guests rooms and the view from the hotel is breath-taking as the property is built facing Dubai’s skyscrapers and the open skyline. The hotel is situated close to Sheikh Zayed Road, Port Rashid (Dry Docks & Dubai Maritime City) and Jumeirah Beach, one of Dubai’s important landmarks. The Hotel is 7 to 8 Kilometers from Kite Beach, Also, the hotel is 20 minutes-drive from Dubai International Airport and a few minutes ride from Dubai World Trade Centre, Dubai International Financial Centre, the Dubai Mall and the Burj Khalifa. Rooms in Ramada Jumeirah are divided into five categories: Classic Rooms, Deluxe Rooms, Premium Rooms and Deluxe Suites (with separate living room). You have the option to either choose a king-size bed or two single beds. Premium Rooms and Deluxe Suites come with a king-size bed. Rooms are ultra-modern and lavishly spacious, furnished with TV with satellite connection, work desk, Wi-Fi connection, en-suite bathroom, shower, bathtub, hair dryer, bath amenities, mini bar, safe deposit and other special amenities. The hotel has two restaurants, one café and one bar on-site. Ginger is the pan-Asian restaurant that serves Thai, Japanese and Chinese cuisines, while CuiSines is an all-day diner that serves international delights a la carte. Located in the lobby, Atrium Café serves light snacks, coffees and fresh juices, while Docks Pub offers British ambiance and English menu. Sama Café is the pool bar located on the rooftop that serves light bites, cocktails and other. 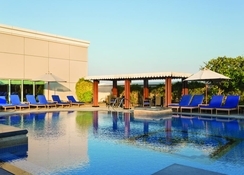 Ramada Jumeirah offers a large heated swimming pool on the rooftop that overlooks the enthralling surroundings and there are sunbeds and umbrellas available. 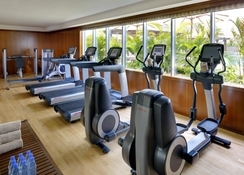 It also offers a plush fitness centre that is equipped with a la mode machines and offers many fitness programmes. Also check out the beauty salon that offers a wide range of beauty treatments and massages. The swimming pool is open from 7am – 10pm, the fitness centre from 6am – 11pm and the beauty salon from 10am – 9pm. Can’t beat this hotel for all facilities, location and value for money, looking forward to our next visit in years to come . The trip to Dubai was a return visit as my wife was very ill on her last holiday. We chose the Ramada Jumeria because it was I great price in a brilliant location. It's position half way between the beach and the Dubai Mall area which made it very convenient. 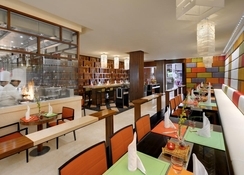 The food was good and the ròom clean and comforable and staff very efficient and friendly. Best hotel and location in Dubai! Vibrant day and night! On the western edge of Sydney's CBD, Veriu Broadway's Ultimo address is a convenient spot to explore this revitalised inner-city precinct that is also a leading educational hub, home to some of the country's top tertiary institutions and learning centres. The area is a convergence point for students and young professionals, and also one Sydney's most transformed precincts. The area has undergone a major urban facelift in recent years, with a $55 million Broadway shopping centre redevelopment bringing in the likes of H&M and Sephora, and the redevelopment of Kent Brewery into Central Park, a mega shopping and apartment complex. A far cry from the working-class slum it was in the late 1880s.